Wow, we’ve had a different start to Year One this year! Beginning swimming lessons from day two has been an unusual routine to start with, but your children have really impressed me with how settled they’ve been as a class. Not to mention how much fun we've been having! The children are all giving swimming lessons 100% and on our mornings at school we have been getting to know one another, exploring the classroom and discovering the nature playground, basketball courts and the oval. If you have not yet brought your child's homework folder in from last year, please do so and we will continue to use it throughout Year One. If you do not have a folder from last year, please let us know, so that we can label a new folder for your child at school. 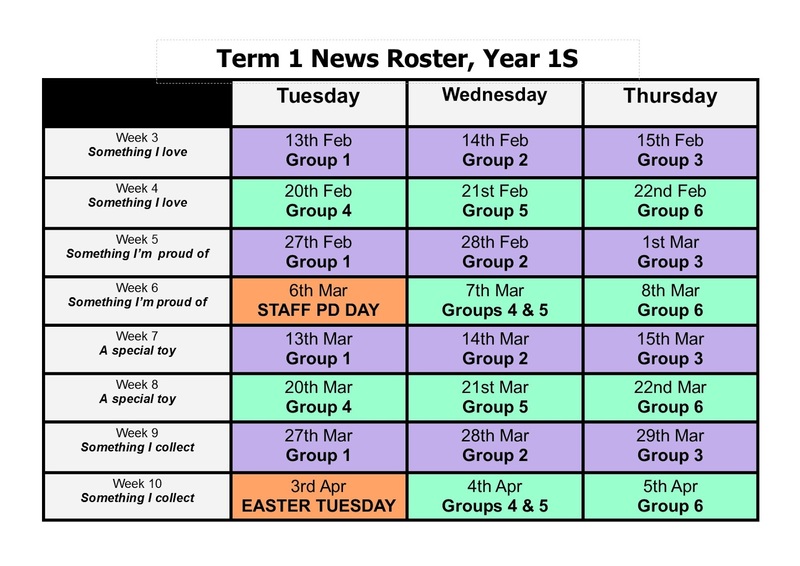 Stay tuned for this week's Newsletter which will outline further details about our whole school Parent Information Evening next Tuesday 13th February. I am in the process of testing the children on their knowledge of both reading and writing a series of sight words. We will begin sending home sight word flash card rings from week 4 onward. We will also commence home reading from week 4. The children should have two different readers go home each week on either a Mon/Wed exchange roster, or a Tue/Thu exchange. I have placed a Parent Help Roster outside the classroom for those of you who may be able to assist at school during our Literacy blocks in the mornings. The roster will commence from week 5. If you have any special gifts or talents that may be useful in our class this year, please let us know! We would love to have you come in and help us, or teach us something! 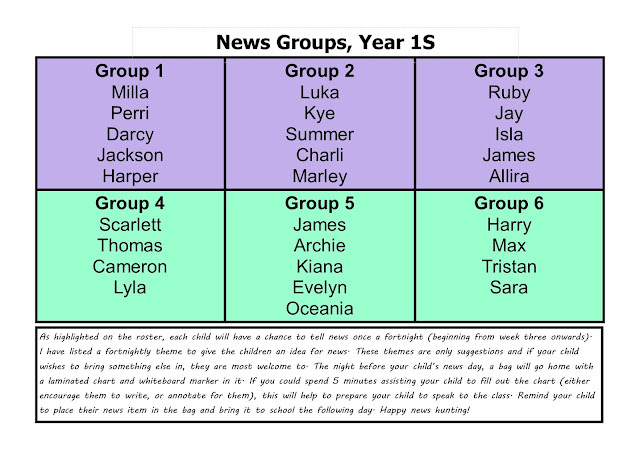 The News roster, as pictured here will go home at our parent information session next Tuesday. As we begin News from week 3, please refer to this copy of the roster. 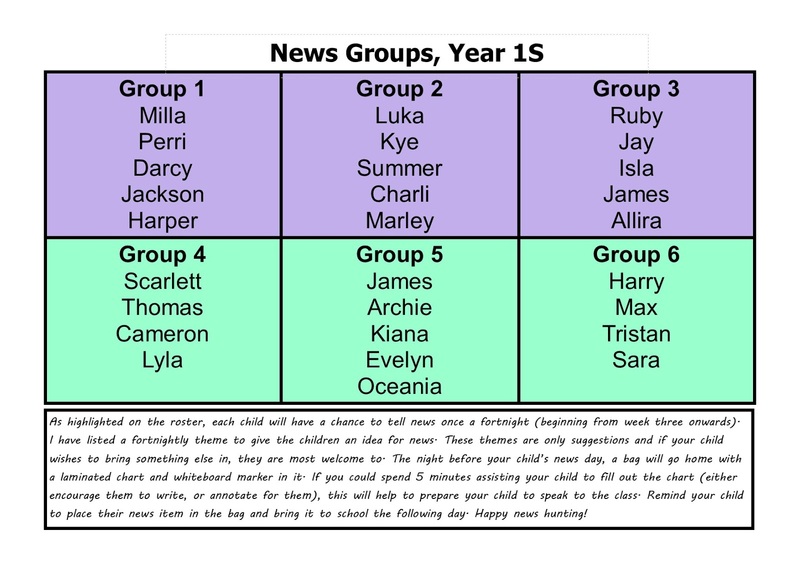 News ideas are suggested ideas only and the children definitely have a choice in what they would like to share with their classmates. I will endeavour to send the News bags home the night before to allow you some time to help your child prepare.